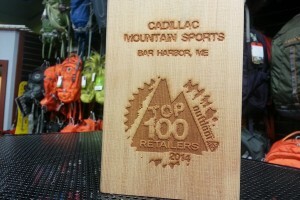 Cadillac Mountain Sports has been selected by “Outdoor USA Magazine” as one of the Top 100 Retailers in the nation. Cadillac Mountain Sports was one of three retailers in Maine selected for this honor. “Outdoor USA Magazine” chose their list based on nominations provided by leading industry brands and distributors. Stores also were able to nominate themselves. The magazine defines an “independent outdoor specialty retailer” as a retail organization that primarily serves outdoor and active lifestyle enthusiasts and does not exceed 20 stores in its operations. Cadillac Mountain Sports, a locally owned business, has been operating for 25 years offering high-end authentic hiking, cycling, running, kayaking, climbing and long boarding gear to visitors of Acadia National Park as well as residents of Mount Desert Island, Ellsworth and Bangor.